Congratulations America, you finally made me break my resolve not to talk about that unholy mess of a human who plagues my social media feed. What is that made me want to talk to my children about this distant cluster f*ck, you ask? It was this video where a couple of Trump supporters were only too happy to support Trump's aspirational quotes ... until they found out they were actually said by Hitler. You would think would make someone re-evaluate their core values: In this case, not s'much. Which is not to say I am going to wade in with some half baked opinion on who should rule 'Murica: To be honest I'm woefully unqualified, comparatively ineloquent, and it has very little to do with me other than the fear shared by many non Americans about how Trump The President would approach the small matter of foreign policy. No, what this three ring circus has really put front and centre in my mind are the unique responsibilities that I have in raising children in the current media age. 1. My children need to be invested in how countries are run. 2. My children need to be able to see past pomp and circumstance in order to make sound choices. That was the easy part, working out an age appropriate way to start having those discussions was what kept me awake half the night. I wanted to find a way to look at the importance of government, not through the ritual of how they operate, but in a way that would speak to the children on an emotional level and on a level that was relevant to their own lives. I also realise this is a pretty heavy topic so I was going to have to keep things reactive and fluid in order to keep their attention. 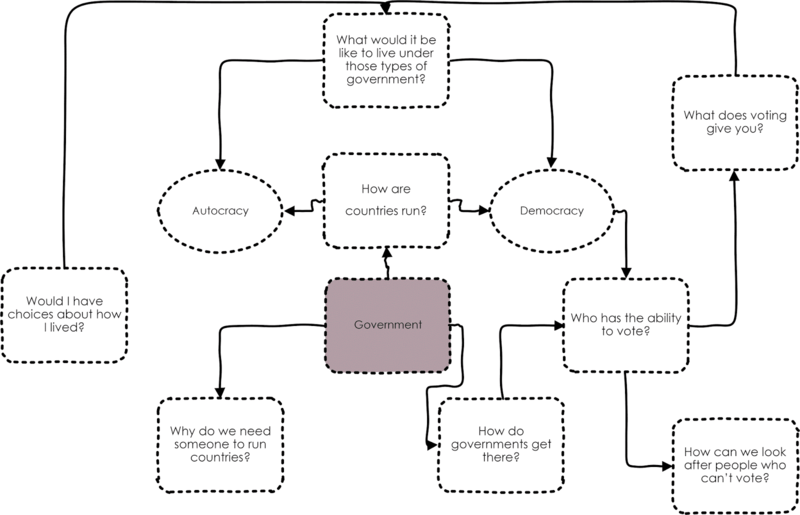 All of which means rather than a lapbook, or a long list of worksheets, I decided to look at the subjects of government with the aid of a spider diagram. Hey don't knock it, I wrote every essay of my degree using one of these! OK so they looked a lot more complex, and made a lot more reference to 17C women's writing, but in principle, same whole deal. These questions were designed to generate discussion with the children, with no obvious answers or logical conclusion. They were also meant to be vague and to give them the chance to take the conversation off in whatever direction they needed. That's a long winded way of me saying that I don't need a précis of all the important questions I forgot to include; which are many and varied. In Part 2 I'll post about what we did with that information (spoiler, it involves a load more questions and a ton of YouTube videos) but that will have to wait for another day because it's hella late, and mama gotta work in the morning.